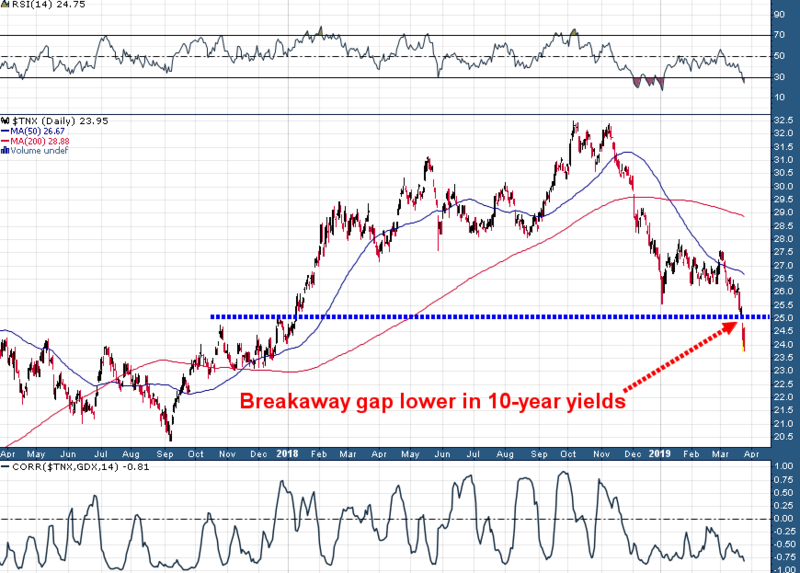 Last Friday's market turmoil created a gap in the chart of 10-year Treasury yields and the resulting technical breakdown has all the key characteristics of a "breakaway gap". A breakaway gap in 10-year Treasury yields is not a common occurrence - in fact it's so rare that it likely means that 2.25% is a minimum near term downside objective in the 10-year, and in all likelihood this tremendously important Treasury Note yield is headed all the way down to the 2.00%-2.10% area over the next couple of months. While this downtrend in bond yields may be bad news for future economic growth and various equity market sectors, it is very good news for precious metals and gold miners. At the bottom of the above chart I added the 14-day rolling correlation between the GDX exchange-traded fund and 10-year UST yields - this correlation is up to an 81% negative correlation which means that as yields continue to tumble the gold miners should continue to rise. This strong negative correlation between gold miners and Treasury yields has been in place since December and appears to only be gaining strength.